The first time I saw Fun House, I only saw the very end... where the kids are running through, well, a fun house of sorts. I thought it was terribly cool (though I don't think "cool" was popular quite yet... that took another year or two, LoL) and longed to see the entire show. It took a while before it happened, and I wasn't in love with the rest of the game, just the final round. Then, I promptly forgot about the show's existence for quite a few years. Now, I think it would do well again... maybe Nickelodeon or The Hub could start it up? Brief history: While it was a short-lived show (1988-1991), the first two years ran in syndication, so tons of episodes were made. In its final year, FOX picked it up, calling it Fox's Fun House. 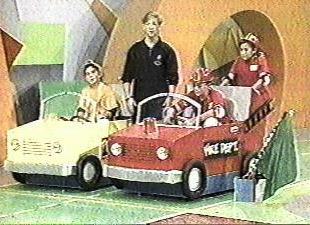 Another version for college students aired in weekly syndication for a while, called College Mad House. It was pretty popular in its heyday, and there were video games, home games, and mall episodes. Notable changes to the way the game is played: At some point during the syndication version a bin was added at the send of the second lap in round 2. It had some tokens that you could pull over and grab if you were willing to spend the time. When FOX took over, the Fun House round included a clock that you could grab, earning your team 15 extra seconds. For College Mad House, the teams had two boys and two girls each, Round 2 was changed from a race to questions where the winner of each could throw a pie at a loser, and Round 3 changed the names of the rooms to fit the college theme. Also, each team member had thirty seconds in the Mad House, regardless of how many flags they grabbed. And, there was no more "magic trip flag" ... you won the trip if you got all 13 flags! Special Contestants:A lot of kids and teens who were popular on television at the time appeared on the show, like Jodie Sweetin, Sara Gilbert, Soleil Moon Frye, Jeremy Miller, Benji Gregory, Danny Pintauro, and Jaleel White. Favorite Rounds: As I mentioned above, the actual Fun House was my favorite as a kid, and it's still the most enticing, I think. My Take: I'd compete if given the opportunity, and I think I'd do well. Um, since I love obstacle courses and scavenger hunts, I'd be all over this. If I needed one partner, I'd choose my friend, BK, since we could keep our eyes on the prize and have a good time. If it was the four-player style, I'd add in Heather, who'd be our speedy person, and my husband, who'd probably come up with a really logical plan for the Fun House. What about you? Who would you choose to be on your team? Did you ever watch Fun House? Did you see the college version, or just the kids one?